Daleys Fruit Tree has Plants for Sale to Crossmaglen and can Mail Order them to you door. Click to Find out how much Freight Will Cost. 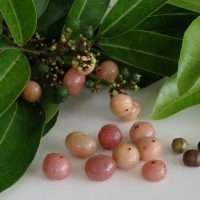 Native to rainforest and vine thickets in tropical Australia to as far south as Bundaberg and spread into Asia this is an attractive small tree with tasty berries. 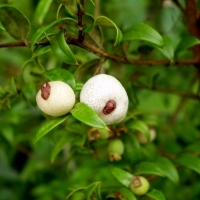 Tiny white fragrant flowers are followed by small orange to pink juicy fruits that are sweet and honey flavoured with resinous overtones. 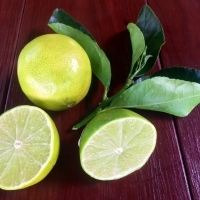 Obviously related to the citrus family the foliage is glossy and aromatic. 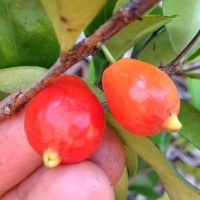 Perfect for use in a mixed screen or bush food garden the orange berry is also a host plant for the swallow tailed butterfly when the plant is young. Fruits make a delicious jam that taste similar to candied honey.